I’m going to be attending SXSW Interactive in March. It runs from March 7 through March 11. On March 11, I’ll be speaking on the day stage. 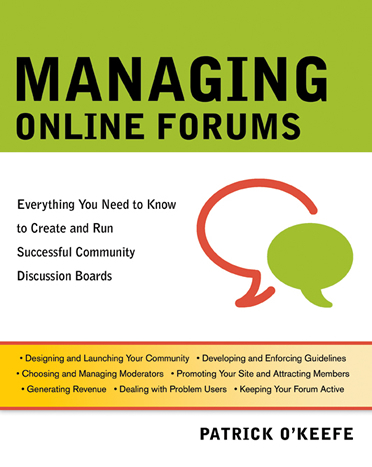 I’ll be doing a book reading for “Managing Online Forums”. It’ll be my first time speaking in this capacity. I will have 20 minutes on stage. I have pretty much decided that I will do a presentation around an idea the book, rather than actually reading from the book. I figure I’ll speak for 15 minutes and leave 5 for questions at the end, if there are any. It’s really my first time doing anything like this. First time standing up in front of a group of people, first time speaking on stage, first time using PowerPoint. Plenty of firsts! Nerves aside, I am excited. In the next week or two, I’ll be coming up with a list of presentation ideas. I’m going to post them over at ManagingCommunities.com to hopefully get some feedback which will help me to pick the best one. If you are going to SXSWi and would like to meet up, please feel free to let me know. I’d love to have you in attendance for the reading. Back on March 5 of last year, I lost my Winamp playlist. I started rebuilding it right away. I’ve posted a few updates since then, as I have continued to work on it as much as I can. This is a historic night. I’ve finished the playlist. I am whole once more. I no longer have to listen to music as work to get my playlist finished – it’s finished. My Last.fm account will finally be seeing some activity again. It took me exactly 300 days. Wow. Back when I lost my playlist, my music libary consisted of 13,657 files in 1,465 folders taking up 47.6 GB of space in all. Now, it’s 17,828 files, 2,004 folders and 64.4 GB. I added 4,171 files in 300 days. That’s almost 14 new songs (basically, an album) a day. LOL. Listening to (and buying) music is definitely a hobby of mine. Cynthiab over at the SitePoint Forums started a topic called “Will Blogging Cause the Demise of Journalism?” She’s from the magazine world and was lamenting the differences between it and the world of blogs, talking about how she can see the different when there are a bunch of writers on a conference call. “I take the transcript and write an “article” (even though it’s for a blog). I shape the piece with my impressions and other information, but while I’m doing that two other blogs have posted the entire transcript without any additional content and it’s all out there,” she said. I made a long reply to this, so I thought that I would turn it into a post here. I think that in some ways maybe, but overall, no. What we have is the internet giving voices to more people. It’s great because some people (like myself) wouldn’t have had a chance to have a voice, but it’s bad, of course, because some of these people that are now given a voice really are best kept quiet because they are slimeballs. But, that’s the internet. It can make the great, greater and it can make the worse, even worse. It’s about you. What do you want to do for your blog? What do you need to do? There will always be room for well researched and thought out articles. There is also value in transcripts, too, in that some people would say they are sick of having journalists, writers, columnists shape how an article sounds – they’d rather just hear exactly what the person said. There is room for both. I practice what I would call responsible blogging. I’d call it journalism, though it’s not as strict as the background she talked about. Basically, it’s considering what you are reporting and checking with sources and, if you need to post something as a rumor, make sure that you clearly mention it’s a rumor and caution your readers to that effect. A few days or so ago, the Daily Mail and the Daily Star were reporting that Sean “Diddy” Combs was changing his official stage name again. This time, to Sean John. And about 50 Google News listed outlets picked it up and ran with it as a fact. I read these reports and I thought “this is weird. If Diddy was going to announce this sort of thing, why would he choose some publication in the UK or Asia or something? Announcing it in the U.S., not in some side quote, would generate the most press.” Diddy’s a smart guy, so I doubted he’d have done it like that. Sensing that this was wrong, I held off on reporting it. Someone left a comment on the blog mentioning it to me and I said I was looking into it and that my guess was that either he was misquoted or someone ran with something he said and stretched it to make a story. I contacted three sources and I heard back from his publicist and she gave me their official comment on it. No, it was not true, his quote had been misinterpreted and she explained why. Within 20-30 minutes, I had an article published. A short article, with some background on why I had held off on the story, that featured the official statement. We were the first outlet to report that the story was false. I contacted maybe 20 outlets that had printed the story that had been proven false to just politely let them know and to give them a link to my story. Only two replied (one within a day, one in the last day or so) and they both seemed like a pretty standard “thank you for your message”. As far as I know, we didn’t get a single link out of breaking it! And then, a couple hours later, MTV reported the story with the statement from the publicist (I’m sure she sent the statement out to loads of outlets). And then a bunch of people linked to MTV and MTV is listed in Google News. Meanwhile, Google News has deemed my site inappropriate for indexing (I’ve talked about this before… perhaps best here)… but, that’s another frustration. A few days before this story, even, we had another story with the former Senior Director of A&R at the label. In early January, a rumors section at a major hip hop site as well as a huge gossip site (that I have no idea why anyone reads because 90% of their stories are nonsense, if not more) reported that he had left the label and that it was because of money and, perhaps, the work environment. In other words, he was unhappy. I spoke with him in like the third week of January, weeks after this story had been passed around. I hadn’t had time to chase it down (and, apparently, no one else had bothered). I contacted him directly via e-mail and asked for his comment. That was like 10:00 PM at night. He replied within 10 minutes asking for a phone number. I gave it and we spoke soon after. He told me that he had left the company, but that it was not because of him being unhappy – he’s now the President of a different company, so he was moving on to better things. He even told me that Bad Boy had offered him a substantial raise to stay and that he had no problems with the work environment, saying that Diddy and another top exec were like brothers to him and were supportive of his move, even though they wanted him to stay. He also told me that he reached out to the gossip site (he named them, I won’t name them since they aren’t worth it) to clear this up and they didn’t reply to him. I told him I wasn’t surprised. And we had a nice chat and he said to contact him if I should need anything in the future. And I posted my story soon after. He was a nice guy. Keep in mind that this is the first time I’d ever contacted him. We spoke on the phone within an hour of me e-mailing him. So, pretty much the only reason that someone couldn’t have reached out to him to verify is because they were either lazy or they don’t want to know the truth (and can get a better story out of a lie). None of this is particularly surprising, of course, as some people do whatever they possibly can to try to make some companies and celebrities (especially Diddy) look bad, but it serves as a nice reminder. The truth is still important to me (as a writer and a fan). The point is… journalism is not dead, you just have to be willing to do it, even when you feel pressured not to. The new site I talked about a couple weeks ago is ManagingCommunities.com. It launched today. I’ve been managing communities since 2000. As part of the iFroggy Network, I run several communities, including SportsForums.net, KarateForums.com, phpBBHacks.com, DeveloperCube, CommunityAdmins.com, PhotoshopForums.com and BadBoyForums.com. It’s something that I’m passionate about and I’ve been wanting to share random thoughts, knowledge and experiences on the subject in a specialized blog for some time. With the book coming out in April, I felt that now was the perfect time to start blogging on the subject. The blog will definitely be random thoughts. It won’t have any kind of set style or format at the start. If I have to ban someone on a given day, I may talk about that. If I had a noteworthy troublemaker or a great experience, I may talk about that. And, hopefully, if anyone contacts me with questions, I can answer those in entries, as well. I’m looking forward to sharing my day to day experiences as a community administrator and I hope that I am able to help some people, in the process. So, please check it out. Thank you for reading. Edit: Thanks to Brad for digging this. Now that I have had an opportunity to tell the staff members at my communities, I can announce it. I am the author of a new book called “Managing Online Forums”. It’s coming in late April/early May from AMACOM (the publishing arm of the American Management Association). It’s available for pre-order on Amazon.com. The book is, in short, all of my community management knowledge emptied out onto pages. This isn’t hypothetical stuff – this is real, battle tested, in use theories and solutions. This is what I do and what I have done in my own communities. I cite real life examples all the way through the book. I cover everything from the development of the community and setting up an infrastructure to managing your staff and dealing with troublemakers. I went through some of this stuff so that hopefully, people who read the book will be better equipped when it happens to them. My hope is that it will be useful to both new administrators and experienced ones as no matter what you think of it, I want it to give you something to think about, if you are passionate or interested in running forums and online communities. In any case, let’s backtrack a bit so that I can explain how I got to this point. I manage communities. It’s something I’ve done since 2000 and something that I am passionate about. In 2003, I had the idea to write a book about community management. I started by writing down ideas as far as things that I could talk about. I would literally be working on my sites and then think, “hey, that’s a good idea” and then I’d write it down. This went on for a while until I felt I had a decent list. I then organized that list into chapters. And, eventually, I wrote it out. I wanted to make sure that I had a book before I tried to find a publisher. After finishing and re-reading it a few times and adding many more things, I decided that I was ready to pitch to publishers. Toward the end of 2004, I started pitching the idea to publishers myself, to a select group that I respected and wished to work with. To make a long story very, very short… there was some interest, some things happened, there was some disappointment and nothing worked out. So, in October of 2005, I spoke with my friend Jeremy Wright. Jeremy had just been working on his book, Blog Marketing, published by McGraw-Hill. It was a very successful project, so I asked him if he could help me, if he could introduce me to his agent. And he did. I ended up signing with the literary agent, Neil Salkind of the Salkind Agency and Studio B. This was a great decision and I can’t thank Jeremy enough for introducing me to Neil, who has been a terrific agent. We immediately went to work on my proposal and what I could offer to publishers. He helped me fine tune it and improve it. He felt that the manuscript needed to be bulked up. It took me a few months, but I got it done and in April or May of 2006, he began to approach publishers. One of the publishers in that first run of proposals was AMACOM. We had a bite from a small publisher… and they decided against it. We had someone at a huge publisher tell us that they liked the idea, but when they looked at competing titles… they all sold badly. So, that was something else I had against me. Older books had sold poorly and even though forums had changed so very much in the 6-8 years since the books were published, I was being held to them. So, we had a lot of nos. But, Neil continued to pitch and to follow up, as we were continually optimistic. And then, in February, Neil heard from AMACOM, from the Executive Editor’s new Editorial Assistant (I worked with her on my book) and they had interest in the project, but wanted to know what I planned to do to market it. We got that to them and didn’t hear back from a while. Neil followed up in March. In April, a full 2 and a half months after the initial interest, we heard back from the Executive Editor, as she let us know that she was discussing the book with the board. She felt the timing was right. The next day we heard back from her and she said she got the green light on the project. Over the next week, Neil negotiated the contract with them, doing some great work. Neil was really terrific and I can’t thank him enough. I signed the deal in May and went to work on finishing up the manuscript. I sent it in, in August. An editor at AMACOM took a look and made a number of suggestions, most of which were incorporated and that’s what we worked on in September. On October 1, I turned in the new manuscript. And then the manuscript went into copy editing. I received a physical copy of the manuscript and had to review it and answer questions to make sure that everything was perfect. I did that and submitted it in November, talking with editors on various things the whole time. I then had to review the galley copy, which is basically the manuscript all corrected and set into the book as it will appear in the finishing project. Once again, reading the whole thing and checking for any errors or typos or whatever. I did that before and over Christmas and got it in, in the first few days of January. And then we went back and forth on a few more things. And I was still reviewing portions of the book until about a week ago. The whole process is one huge period of constant communication between myself and 4-5 editors, always moving and progressing. It was really interesting to watch it evolve and watch the book improve for a first time author working with a good sized publisher. It took a lot of hard work on the part of numerous people, but here we are. The book will be released at the end of April or the very start of May. It’s available for preorder at the biggest online book stores and, judging from AMACOM’s bookstore presence, it will be in some physical booksellers, as well. Things for me to approve and edit are getting less and less and are nearly non existent. So, now, the focus really turns to marketing, which I am very excited about and which will be a lot of fun for me. Toward that end, I’ll be launching a website dedicated to the book, as part of the iFroggy Network (but that’s not the new website I eluded to a couple weeks ago). This is the first public word I’ve said on it. Why? Well, I really wanted to make sure it was coming out before I said anything publicly. That’s just how I am. My family even had no idea until I had a contract in hand. For the most part, the only people that I’ve told were those that were working on the book or had something (contribution, advance praise, feedback, etc.) to do with the production of it. And now, about five years after I came up with the idea, I’m finally talking about it publicly. It’s an interesting feeling to keep something to yourself for so long and then finally announce it. And I’ll now be talking about the book more and more now. I’m very happy with how the book turned out. The editors (Jacqueline Flynn, Erika Spelman, Christina Orem, Ashley Hamilton and Jennifer Holder) at AMACOM have been terrific – absolutely terrific. They are top notch people and I’ve really enjoyed working with them. I’m really glad that AMACOM ended up being the one to publish the book. Jacquie was the one that believed in the idea and I’m grateful for that. I appreciate the chance they are taking and the opportunity that I have been given. I’m confident that the book will be a successful project for everyone and I’m determined to work with the marketing folks to make that happen. I’m also thankful for everyone else that took part in the project in one way or another, everyone who supported me and everyone who shared in my enthusiasm and rooted me on (Chrispian Burks, Brandon Eley, Jared Smith, Stephan Segraves, Bryan Downing and others) as that truly meant a lot. I also have to thank every staff member at my communities that has been supportive of me and worked with me to accomplish the goals of those communities. My staff members helped me to reach this point. Everyone around me was optimistic and I was optimistic and… it’s happening. Cool stuff. It’s hard to describe. I’ll have to post the book’s acknowledgements up online so that I can properly thank everyone. But, thank you. Well, I think this post is long enough. I have some more exciting news, but I’ll throw that into another post tomorrow or something. In the mean time, thank you for reading this one. I appreciate any and all interest in the book. If you know anyone who might be interested in it, please mention it to them. If you find an opportunity to blog about it or post about it somewhere, that’d be awesome and I appreciate it. If you want to review it for your site or publication (no matter how big or small), please let me know. Early reviews have been great (I’ll have to post the advance praise up soon) and I’m anxious to see how it is received in general. I hope that the book helps community administrators and I truly believe that it will. That’s all for now. Well, I’m back. Just catching up on some things. I didn’t intend to be away as much, but that’s just how it worked out. I’ll have some big news to share in the next couple days, but I want to tell all of my staff members first. I just wanted to mention that posting may be light over the next couple weeks. I’ll be around for the most part, but won’t have as much of an opportunity to post. As an aside, I’ll be launching a new site in the last week (or so) of January. Really looking forward to it. After stopping due to the writer’s strike, Carpoolers returns tonight at 9:30 PM ET. Me and my brother had picked up the series, watching it from the beginning when it debuted last year. Definitely glad to see it return as we’ve enjoyed it. I’ve decided to go ahead with this. The set up I mentioned seems like something I’d like. I’ll be shopping for accessories within the next couple of weeks and then I’ll start putting it together. With my new PC now in use, I was thinking about what I could do with my old PC and the only idea that really appealed to me as potentially setting it up as a media center or DVR. But, I’m not sure how reliable and easy to use they are as I have little experience with them. I’d like to place the machine in another room with it simply plugged in – no periphreals attached (except for what is needed for the media center). I’m then wanting to limit the wires/cables needed and also be able to manage everything through my TV and not have to hook into the PC directly. This seems like it might be something, but I’ve never used any of that. Assuming it’d be reliable, easy to use and worth doing, I’d be willing to spend money to get it all set up, but I’m just not sure if it is worth it. Anyone have any experience?